Home — News — What do YOU live and breathe? What is your passion? What do YOU live and breathe? What is your passion? What do you live and breathe? What is your passion? Maybe it is gardening? Or surfing or music? I live and breathe making art and it is my God-given passion so I have zero guilt about enjoying it to the fullest whenever possible! I hope you all can do the same with whatever your passion is. 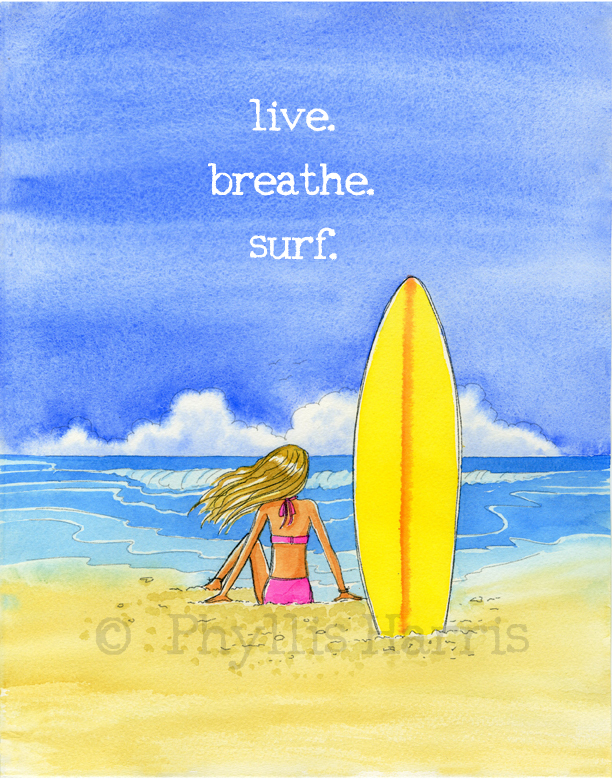 When we spent a month in Kauai this past February, I noticed there were lots of folks who live and breath to surf. I so enjoyed watching them! I have always wanted to learn and I still plan to one day but for now I will live vicariously through my art. I'm not sure what I am waiting for... I just need to do it! Here is my most recent creation, again, the visit to the ocean is an obvious recurring theme. That is because the ocean is also one of my passions! Again, this one is available with customizable hair color and it available with or without text. This print is available both at my shop at Phyllis Harris Designs as well as my shop at Etsy and it comes in many sizes as well. Wishing you lots of warm and sunny days ahead!